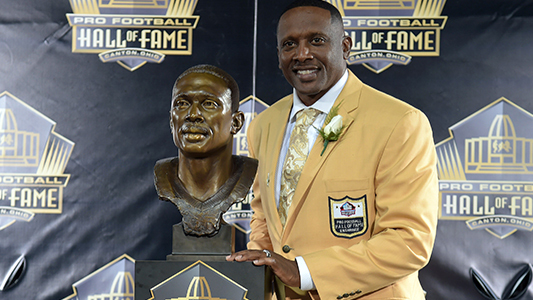 Tim Brown, National Football League Hall of Fame inductee, will speak during Southwestern Assemblies of God University's (SAGU) chapel on February 20. Brown spent 17 seasons (1988-2004) as a wide receiver in the NFL with 16 of those years spent with the Oakland and L.A. Raiders and one season as a Tampa Bay Buccaneer. Brown was selected by the Raiders in the first round of the 1988 NFL Draft and would set the Raiders franchise records for receptions, receiving yards, and punt return yards. At the time of his retirement, his 14,934 yards were the second highest total in NFL history. While Brown's NFL career is beyond impressive, it was a decision he made in June of 1996 after 8 seasons in the NFL that would turn his life around when he dedicated his life to Christ. The chapel service on Wednesday, February 20, will begin at 10:15 a.m. To access the live broadcast of the service, click here.